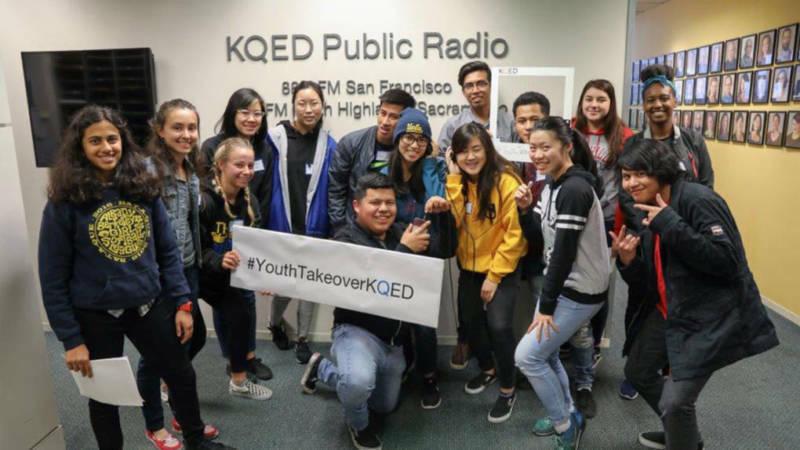 The first-ever Youth Takeover of KQED News is in full swing. From students’ personal experiences with post traumatic stress to the future of farming (hint: it involves lots of fish poop), Bay Area youth are being featured on air and online throughout this week (April 23 to 27). Back in February, students at 10 Bay Area high schools pitched story ideas to KQED journalists and staff. About 20 stories will hit the airwaves and another 60 are featured on KQED.org. Click on each school in the map below to see a rich array of stories produced by a diverse group of students from across the Bay Area. For Hannah Shin, 17, a junior at Santa Clara High School, adding her voice to the Youth Takeover was a welcome departure from her “normal” life. In addition to finding a home on KQED News, some student journalists will share their stories at a live showcase at the Brava Theater in San Francisco. It’s a free event and open to the public, but tickets are required (get them here). For the Youth Takeover, student journalists reported on stories from their schools, neighborhoods and personal experiences, touching on major issues like immigration, homelessness, mental health, cultural identity and the future of the California dream. The chance to share her story with a wider audience was a powerful learning experience for Vaidehi Dandekar, 14, a freshman at El Cerrito High School. If you’re reading this during Youth Takeover week, you may have already heard youth voices on the daily newscast at 6:22 am and commentary on Perspectives at 6:43 and 8:43 am. The Takeover will culminate on Friday, with youth co-hosting Forum and The Do List (at 6:22 am; 8:22 am). Youth voices will also be featured prominently on The California Report Magazine (4:30 pm; 6:30 pm; 11 pm) and KQED Newsroom (7 pm, KQED Channel 9).